Once you've made your final markdown, your clearance inventory is a ticking time bomb. The longer you wait to sell it, the more it costs you. In our experience working with thousands of retailers, we've learned two myths that cost retailers millions of dollars every year. Myth #1: You're breaking even when you mark a product down to your original cost. The Truth: Because of carrying cost, the unit can actually cost 12% - 25% more than just your purchase price from the manufacturer. Carrying cost increases the longer you hold on to the inventory. Original Cost: The price you originally purchased the unit for from the manufacturer. We're excluding this cost in the graphic above since it's already a sunk cost. Carrying Cost: The additional costs associated with managing and accounting for inventory once it's been stocked on your shelves. 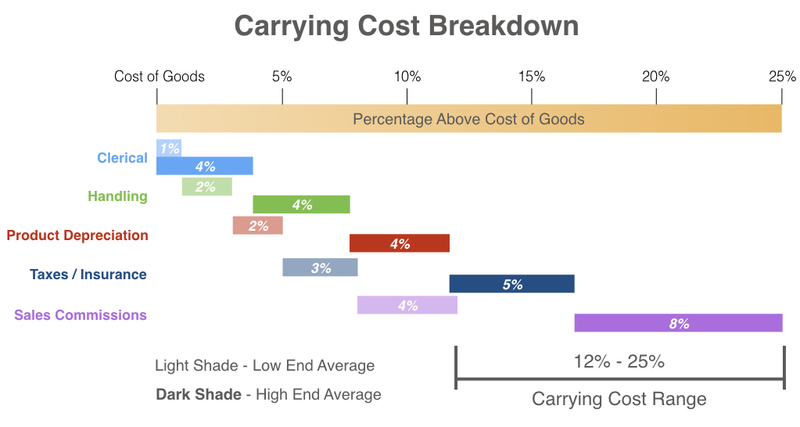 Carrying cost is a linear, growing expense. 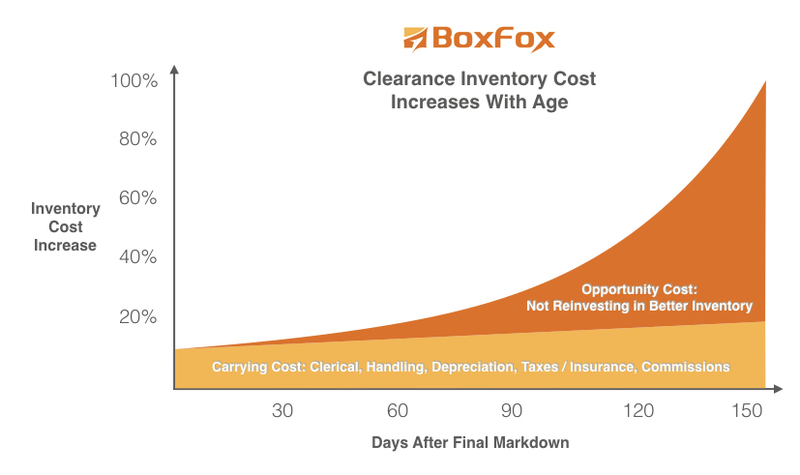 Opportunity Cost: Each day the clearance item is on your shelf you're missing an opportunity to invest that money into new inventory that grows your net profit. Opportunity cost is an expense that grows exponentially, due to the compounding effect of return on investment. Clerical (1-4%) - It takes managerial time to keep pricing data current in your POS during your markdown cadence. Many POS systems provide 3 main ways to do this: grouped by supplier, grouped by SKUs, or done manually one SKU at a time. Each method takes employee time to properly maintain the data. Handling (2-4%) - Time and effort of your staff to count inventory, update the tags and labels, keep products clean and move them around the store. Product Depreciation (2-4%) - Over time, products can become damaged or lost. Taxes and insurance (3-5%) - Unsold inventory represents an expense you've already incurred that hasn't yet turned into revenue. The more excess inventory you have on hand, the smaller the deduction on taxable income for your operating expenses. Sales Commissions (4-8%) - These are additional financial incentives you provide your employees to sell clearance products and move them off your shelves. These can significantly affect the actual price per unit of your merchandise. Myth #2: Once you've made the final markdown, keep the inventory on the shelf until it finally sells. The Truth: 5-6 months after your final markdown, your actual cost per unit has more than doubled over your original cost. The longer you wait for a clearance item to sell, the more expensive that item becomes. This is because you could have sold that unit (even at a loss) and gotten cash to put toward the purchase of a new, better selling unit. The opportunity cost is the revenue potential you forego by continuing to wait for that clearance item to sell. After 180 days (2 inventory turns), you could have generated a net profit of $640 / 10 shoes = $64/shoe. That is 107% of your original $60 cost per unit. Your actual unit cost has already more than doubled after 180 days. Try out our inventory reinvestment calculator to see how this compounding return on investment could impact your store. The longer you wait to sell your excess inventory, the more expensive it becomes. In addition to the physical carrying costs associated with maintaining the inventory, you're also missing out on the opportunity to reinvest the proceeds into new merchandise. Stop Waiting. Start Selling. Do Clearance Better.